Built-in Properties and Methods in "Object.prototype"
∟Built-in Properties and Methods in "Object.prototype"
This section provides a quick description of built-in default properties and methods in 'Object.prototype'. A tutorial example is provided to dump what's in 'Object.prototype'. As I mentioned in the previous section, the default prototype object is created from the "Object()" constructor function. Its prototype object, "Object.prototype", is the base prototype object of all other prototype objects. 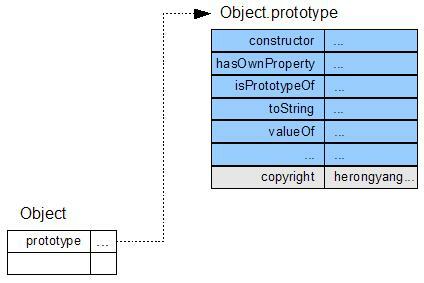 Therefor, properties of "Object.prototype" will be inherited by all objects. "constructor" - Property pointing back to the constructor function of this object. "hasOwnProperty(prop)" - Method returning true if the specified property belongs this object, not inherited from its prototype object chain. "isPrototypeOf(obj)" - Method returning true if this object is one of the parent prototype objects of the specified child object. "toString()" - Method returning the string representation of this object. "valueOf()" - Method returning the primitive value represented by this object. ►Built-in Properties and Methods in "Object.prototype"